Odysseus is the story of the ancient Greek warrior who returns home following the end of the Trojan War. On your journey back to the motherland you will encounter an array of artifacts and prestigious gifts that will have you returning home even more heroic than once presumed. Enjoy 5 reels and 30 paylines along with a top jackpot reward of 10,000 credits. Learn how to play online slots today! Travel back in time to the turbulent time of the Ancient Greeks. An era in history filled with great minds, ferocious battles, progressive architecture, theocracy, and wooden horse deception. 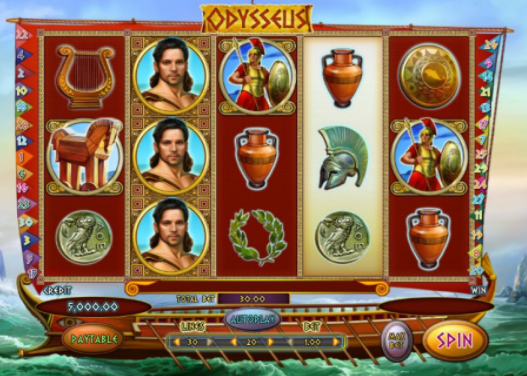 This slot game features on Odysseus and his return back from the iconic Trojan War. This 5 reel, 30 payline slot game is filled with wonderful paylines, free spins and great jackpots that can be all yours with a little bit of risk. Explore the best online slots with good bonus and win features. This installation doesn’t offer anything exuberant or over the top, it’s just a simple 5 reel with a gamble feature and the opportunity to win some free spins. Odysseus was the adorned king of Ithaca who is the central protagonist in Homer’s epic tales of the era. The Odyssey describes Odysseus’ trip back from the Trojan war and the feats and conquests that he had to overcome. The 5 reel version of this is a lot less complicated and artful but nevertheless does the job. The Gameboard of this game is a Trojan warship that floats steadily on the ocean. The sails of the ship is where the reels are housed. There’s harps, pots, Trojan Helmets, Trojan horses and the ship symbol which acts as the game’s WILD. This can be substituted for many other symbols on the gameboard. The Scatter Icon is the GODDESS statue which is where you’re going to get your free spins from. Find five scatter symbols and you will trigger a whopping 100 free spins. Think of the possibilities of 100 free spins. That brings us onto the Gamble feature, in true Odyssey it’s always good to gamble, just like Odysseus did when he took 10 years to return home to his wife. Every spin gives the player to double, triple, or quadruple their winnings. Odysseus is a wonderful slot game that has a theme that everyone has some sort of familiarity with which is why these sorts of games are so successful. The gameboard looks amazing and upholds the theme with the gamble feature adding a pull factor to the more risk-taking gamers out there. Either way, Odysseus is completely worth a spin. Try out some of the other great games that are available across the Wizard Slots platform.